Do you suffer with a summer allergy? Summer flu or allergies? What’s making you look and feel so sick? 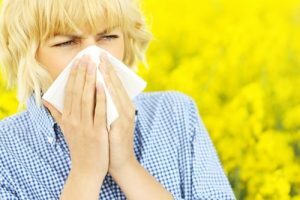 The summer is generally a time when people enjoy the outdoors, but some individuals may be taken by surprise when they start developing symptoms of allergies they never experienced before, particularly symptoms that go beyond the usual sneezing and stuffy noses. If you’re experiencing allergies for the first time, you may mistake them for another condition, such as the flu. For treatment to be effective, you need to know whether you’re dealing will allergies or another illness. Congestion can impact the blood vessels under your eyes, leading to swelling and dark circles. Nasal symptoms may cause the adenoids, which are the lymph tissues in the back of your throat and behind your nose, to swell up, which can make your face look tired and droopy. Chronic nasal congestion will make you breathe through your mouth constantly. If you don’t have a fever, these changes are more likely to be caused by allergies than the flu. During the summer, air pollution, mold and pollen are common allergens that may trigger these symptoms. Additionally, if you are allergic to pollen, your immune system may overreact to certain fruits and vegetables associated with these pollens. Signs of this kind of reaction may include gastrointestinal distress, or itchiness or swelling around the mouth. If you are experiencing allergies for the first time in your life, you may be looking for solutions. Personal health advisors can direct you to knowledgeable providers and licensed allergists who can pinpoint your triggers and create treatment strategies. This may include the use of prescription or over-the-counter medications. If you need to work outside, you may find it helpful to wear protective eyewear or facial masks. Whatever your individual situation may be, taking a personalized approach to the problem can be very effective. To learn more about how to deal with nasal allergies, also known as hay fever, click here.